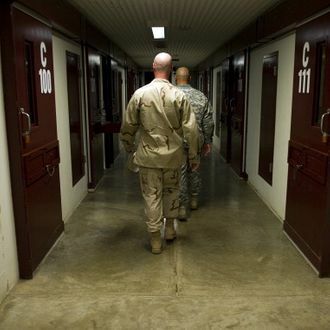 When guards at the Guantanamo Bay prison tried to move hunger-striking inmates living communally into individual cells on Saturday, the detainees did not go quietly. They fought back when guards moved in, using batons, broomsticks, and mop handles to resist the forced return to individual cells, so the guards fired rubber bullets that hit at least one inmate — the only injury being made public. The guards decided it was time to break up the inmates’ communal living situation because they had been covering up security cameras and windows. While one official “noted that there are always small numbers of detainees on hunger strike at the base,” the larger protest got underway in February in response to intensified guard sweeps of prisoners’ cells, including searching their Korans, the Washington Post reports.